Fire pits are great for entertainment while camping or in a backyard, but we also enjoy them for cooking. Everyone has experience making some minor things such as s’mores, but there are tons of other things that can be done with even the most basic of pits. This article is a guide on how to cook with a fire pit, and gives some general information to think about when considering cooking with a fire pit. Depending on the type of fire pit you use, the type of wood, and the way you intend to cook, there are a variety of cooking methods available. See below for more information, including a few fun recipe ideas for the fire pit! 2 So, how can one cook with a Fire Pit? There are a few variables to consider when getting ready to cook on your fire pit. These include the type of fire pit you have, the wood you intend to use, safety issues, and smoke. 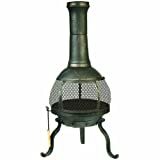 There are many different styles of fire pit around, including homemade rock fire pits, rumble stone fire pits, fire bowls, copper fire pits, and other adventurous designs like the SoloStove Bonfire. If you’re planning to use a metal or copper fire pit that is in a specific shape, it can be pretty easy to find a grate that will match your fire pit (as well as a spark screen). Home made and custom fire pits are a bit more complicated to deal with, as the sizing is in no way standardized. One of the first considerations involved when using a pit is to choose the wood carefully. Different types like cherry or hickory will influence the flavor of the food immensely. People who don’t want something fragrant should consider using old, non-pine options. Pine is not recommended because it is frequently full of sap and won’t burn well. It’s best to keep the pinon wood away from the cooking, as the resins in the pinon will not work well for cooking. Once you’ve completed your meal, though, adding some pinon wood to the fire pit will help keep the bugs away, and also create a wonderful scent. Any cook should keep a full bucket of water nearby to stop the fire from spreading in case of accidents. The pit should also be surrounded by rocks or stones in case of sparks if it’s a built-in fire pit. 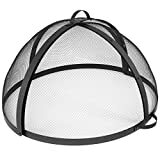 A spark screen can be super helpful as well, depending on your circumstances, and is definitely worth having on hand. People who are worried about the smoke should try to sit away from it as much as possible. Unfortunately, there isn’t much individuals can do to stop smoke except change the type of wood used. If smoke is constantly a nuisance, but you love the environment that a fire pit provides, you may want to consider a chiminea. Chimineas function to channel smoke up and away, and tend to be a bit more comfortable to sit around than a fire pit. Open wall chimineas like the Deckmate Sonora are ideal for those who want the fire pit vibe with the chiminea functionality, especially when you consider that the Sonora is only a bit more expensive than a high-quality fire pit spark screen itself, and the Sonoroa includes an open-wall fire pit, spark screen, and chimney! So, how can one cook with a Fire Pit? There are two basic options: using a skewer or using a grill. Skewers are just long, pointed sticks. Most places sell metal ones with wooden handles to prevent burning and stop the spread of heat to the holder’s hand. Just about everything in existence can go on one! People who have made shish kabobs know that meat, vegetables, and even fruit can be roasted on a stick over a fire. All the cook needs to do is put their desired food on the skewer and hold it over the pit until it’s complete. 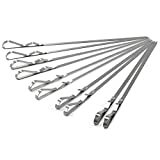 The BearMoo kebab skewers are an excellent option for fire pit cooking, though there are many high-quality options for skewer cooking. And even if you want to use skewers to cook, you still may want to get a fire pit cooking grate to complement your fire pit. Fire Pit Cooking Grates (see our reviews of the best grates here) can be more fun and also a bit more work. Depending on the design of the cooking grate, the metal will sit on the lip of the fire pit, or may be attached to a stake in the ground, adjacent to the fire pit. These cooking grates create a grill-like environment over your fire pit and are a really fun and practical addition to your fire pit. If don’t to have both a charcoal grill and a fire pit, you can skip the charcoal grill and just use your fire pit as a cooking system, in much the same way your grill works. You can even use charcoal in most fire pits! 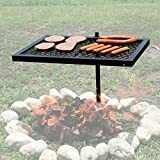 Our favorite is the Texsport Heavy Duty Fire Pit Cooking Grate. The user can place whatever they want on the surface, including meats like chicken breast, hamburgers, and freshly caught fish that have been deboned and filleted. If you don’t want to get a fire pit grate, you can always just wrap up your food in aluminum foil and place it adjacent to the fire pit. It will roast inside the aluminum foil, and foods cooked this way can taste fantastic. Aluminum foil can be used with just about every recipe, including raw meats and vegetables. The foil will not burn or melt (unless you have a preposterously hot fire pit!) but can keep the delicious cooking juices inside. All the user needs to do is put whatever they want to cook in the pit inside of the foil, along with any seasonings, olive oil, etc. Then just wrap the food completely in the foil and seal. This packet should not be put directly into the fire. Instead, it’s placed on the ground near the fire, or on a stone close to the fire. Of course, if you have a fire pit cooking grill, you can place the foil right on the grill, as well. 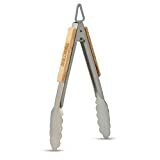 You can use grill tongs like GRILLHOGS tongs to turn and reposition the aluminum foil packet, and depending on cooking time, you’ll have your food done in no time. Don’t forget those seasonings, spice rubs, olive oil, etc. for extra flavor! These can be spread along the inside of the packet or applied directly to the food for an even more delicious meal. Everyone knows how to make the basics over a fire pit, including marshmallows and hotdogs. But there are tons of different recipes available that people can try, here are a few fun fire pit cooking ideas. First, it is possible to make cinnamon croissant rolls on a skewer. All a person needs is one of those tins of croissants (we love Annie’s croissants), cinnamon, and sugar. The roll should be sticky and will wrap around the skewer. The roll is then covered in a mix of cinnamon and sugar and held over the pit for five minutes. As you’re cooking, be sure to regularly rotate the skewer to ensure an even cooking process on all sides. Another fun option is a banana s’more. It is a bit different than a traditional s’more, but it has all the elements. Take a banana, slice open the skin, and make horizontal cuts in the flesh of the fruit. Then fill those spaces with marshmallows, chocolate, caramel, peanut butter, or Nutella, or anything else that strikes your fancy. Then set the banana on the grill until everything melts. It can all be scooped out with graham crackers, making it a dip of sorts. Finally, chilis are super easy with a fire pit. It’s important to have a cast iron skillet which won’t overheat under the flames, and you’ll need a fire pit grate as well. Fill the skillet with all of the ingredients for a stew or chili, including meats and vegetables. Lift the skillet onto the grill and allow it to sit until the ingredients are finished. Voila, instant dinner! Fire pit cooking is easy, but its easy to make mistakes when cooking with a system you don’t use so frequently. The following things should never be done. Do NOT stick hands in the pit while there is still a fire, or the ashes or charcoal are hot. This includes not touching the stones that form the pit, the grill grate, or the outside of a metal fire pit. Never put foil directly into the flames. Don’t use an accelerant like gasoline in the fire when planning to cook. The fumes are toxic. Always check meat to make sure it’s done before eating. These basics and sample recipes can help individuals get the most out of their fire pit. Remember, humans have been cooking over a fire for millennia, and there’s of new ways to make the favorite foods of any campers or visitors over the fire. Enjoy, and try some of our recommendations for fire pit cooking!